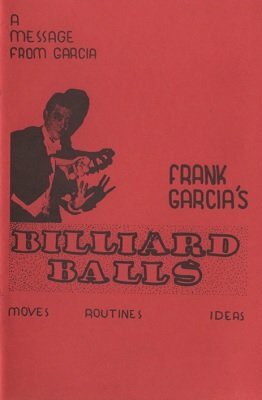 There has always been a shortage of books on billiard ball routines, but here is one on that subject you will enjoy using. Not only has Garcia set forth many facets of ball material, but they are clearly and beautifully illustrated by Harvan, who is an excellent manipulator himself. The material on routining is followed by handling of the ball and shell, then a Master Routine, The One to Five Slow Motion Production, Bilious Balls, Strictly One Hand, One to Four With Solid Balls, Advice and Thoughts on Balls, Simple Golf Ball Routine, all very well explained. Many illustrations. 1st edition 1960, 23 pages; 1st digital edition 2015, 27 pages.